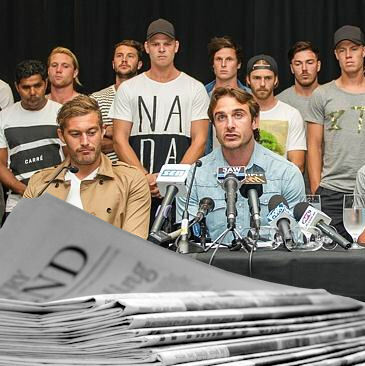 As we all now must know, the Bombers are free to line up with their stars in the clear after receiving a not guilty verdict yesterday, as the AFL’s Anti-Doping Tribunal cleared 34 listed Essendon players (LINK HERE). Ben Says: What a big day it was in Australian sport. What it means for fantasy is quite simple. The likes of Tom Bellchambers (priced at $281,000 in AFL Fantasy and $308,000 in Real DreamTeam), Michael Hibberd (priced at $506,000 in AFL Fantasy and $504,200 in Real DreamTeam) and David Zaharakis (priced at $545,000 in AFL Fantasy and $542,900 in Real DreamTeam) all become relevant. Bellchambers should be one of the most picked rucks of the season now, with his severe under pricing throughout the competitions. This also means the opposite for rookie options in Elliot Kavanagh (priced at $142,000 in AFL Fantasy and $148,600 in Real DreamTeam) and Lachlan Dalgleish (priced at $219,000 in AFL Fantasy and $156,200 in Real DreamTeam). Both are still relevant in most competitions, but their job security and role has now been clouded in uncertainty. Buyer beware. Rodney Eade spoke after the Gold Coast Suns final main session ahead of their clash with the Demons at the MCG on Saturday afternoon. He’s confirmed what was becoming the centre piece of discussion in the fantasy community, Gary Ablett will play (LINK HERE). Ben Says: Well what can you say, after much speculation on whether he will or won’t go for Round 1, we’ve got our answer. Gary Ablett Jnr., fantasy lord and ruler of all things football, will play. So where does this leave us? Priced at $675,000 in AFL Fantasy and $672,400, Ablett is usually a no-brainer pick when we consider that, as Calvin would say, we get two Gary’s. But here’s the problem, and the reason why people should hold doubts about starting the champ in both competitions. We have not seen him play, he has had a full preseason of no contact and he simply can’t get that level of match conditioning from running around. He has averaged 108.6 in his last 5 against the Demons and a score even at the 120 mark will not see his price sky rocket in either competition. Create a plan of action to bring him in, watch him play and see where he’s at. Execute the plan and it’ll be no big loss. Or start with him, and no full well that you’re taking a $670,000-odd risk. Young gun Will Hoskin-Elliot has been sidelined for 4-6 weeks after injuring his right shoulder in the last week of NAB Challenge. The Giants head of athletic performance, David Joyce, released this statement to the media (LINK HERE). Ben Says: Whilst this comes as unfortunate news to the Giants and Will himself, there is a positive for us fantasy coaches to take out of it. Hoskin-Elliot is one of the up-and-coming stars of the competition with his speed and athleticism rarely matched. He plays as the third tall forward with stints up the ground, a very similar role to what we expect Cam McCarthy (priced at $136,000 in AFL Fantasy and $167,600 in Real DreamTeam) to play for the Giants this season. Cam was expected to be in the Round 1 team prior to this injury, but his job security has now increased for the first 4-6 weeks as a byproduct. He’s certainly worthy of a spot on your forward bench in both competitions. Michael Talia is set for a big campaign ahead after completing the preseason, and under the tutelage of new coach Luke Beverdige, he’ll be starting 22 this season. Talia spoke to AFL.com.au’s Ryan Davidson on Sunday (LINK HERE). Ben Says: In a year where the defensive rookies look as bereft as I’ve seen in my fantasy footy career, the Western Bulldogs Michael Talia could prove to be an absolute godsend. Priced at $161,000 in AFL Fantasy and $203,200 in Real Dreamteam, Michael is worthy of consideration in both competitions this year. In 2013 he played 9 games at an average of 66.2 points per game, which is far above the average output of a rookie. Looking closer at his game on the weekend, Talia had 20 touches and 5 marks in a patrolling role across the backline, furthering the point that a mid 60 average is more than plausible. if you’re having trouble settling on backline rookies, I’d highly recommend the Dogs #32. The Western Bulldogs have promoted 31 year old Brett Goodes back onto the senior list after a sterling NAB Cup. Speaking to the media on Friday, Brett also outlined how a new coach meant new opportunities (LINK HERE). Ben Says: Brett has done it for us once before and all signs point to him producing once more. Having averaged a more than respectable 79 from 13 games in 2013, Brett has reaped the opportunity that has fallen too him after the injuries and departures that have hit the Dogs in recent times. Priced at $192,000 in AFL Fantasy and $267,300 in Real DreamTeam, Goodes has ridiculous value if he can get within the ball park of that aforementioned average. On Saturday night against the Pies, he played on the wing running to both halves of the ground as he nailed two goals in a 5 minute patch on his way to a score of 99. If he’s named Round 1, he’ll be hard to bypass. Swans new recruit, Isaac Heeney, has been turning heads on the track, co-captain Jarrad McVeigh says. The new favourite has received O’Keefe’s number 5 and the 29 year old thinks he’s more than deserving (LINK HERE). Ben Says: I’ll be short and sweet here, if Heeney plays a full season I don’t see anyone getting near him in the Rising Star. Priced at $246,000 in AFL Fantasy and $137,900 in Real DreamTeam, even at his Fantasy price he’s worthy of some strong consideration. If named Round 1, you won’t have to worry about that slot on your Fantasy team for a long while! Paul Roos spoke to the media on Monday and gave the answer to the most obvious question in AFL football (LINK HERE). Ben Says: Just so everyone is aware, there’s no need to worry on this pick. Hogan’s job security is as strong as Ollie Wines’ quads. Priced at $194,000 in AFL Fantasy and $138,900 in Real DreamTeam, Jesse’s highly relevant in both competitions due to his propensity to push high up the ground with a certain Nick Riewoldt-esque style. Coming in at a mature age of 20, you should have no problems in picking up this hyped unit. Thanks for reading! This Thursday night is of course the opening clash between Richmond and Carlton. #FantasyFM, a live fantasy radio call of the game will be on DT Live from 7PM. Jump in the chat and ask as many questions as your heart desires in the lead up to the first bounce. Good luck for the season ahead, may the best fantasy coach win! where is that best place to access BEs ahead of R1? btw Gamblers league codee: 9x5cwswt Join up… this is the real thing! Great article Ben, especially as two of the players mentioned are under scrutiny for my team. Are you planning on doing similar articles throughout the season? forward – The Bont, T. Adams, Dahlhaus , Zorko, Bennell. If Vandenberg and Naismith aren’t elevated by now, is it safe to assume they won’t be playing round 1? Anyone have an elite league to join? ?